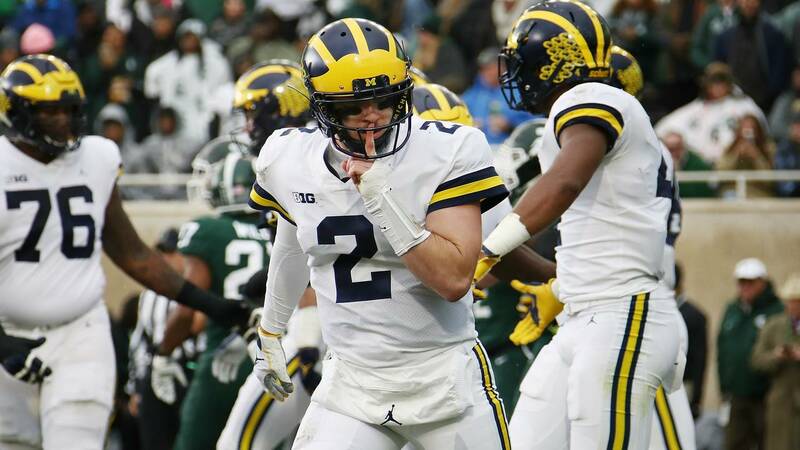 ANN ARBOR, Mich. - The Michigan-Michigan State football rivalry had been teetering on the edge of genuine hatred for a decade, but this year's matchup finally cemented it as one of the best in college football. For the Spartans, the Michigan game has been circled at the start of every season. Mark Dantonio has made a living off beating Michigan, winning eight of 12 meetings. 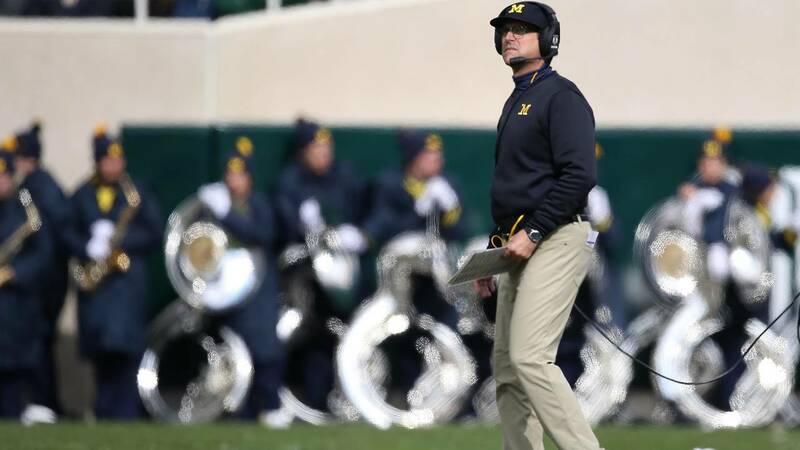 The Wolverines never gave MSU as much attention, and that showed in the results. Since 2010, few college football programs nationally have had as much consistent success as Michigan State. MSU has reached double-digit victories six times during that span, won two New Year's Six bowl games, appeared in the College Football Playoff and earned two outright Big Ten titles. Michigan floundered under Rich Rodriguez and Brady Hoke during parts of that stretch, but since 2015, Jim Harbaugh has turned the program around. The Wolverines have been as competitive as any Big Ten team, outside of Ohio State, on a national level -- coming one play away from a division title in 2016, and in the mix again this season. The rivalry had everything it needed to be considered among the country's best -- two competitive teams, close proximity, fans that have to intermingle heavily throughout the year -- but it was Michigan's refusal to acknowledge MSU as an equal that held the rivalry back. That's not a concern anymore. For the first time in the Harbaugh era, Michigan players and coaches didn't try to pretend there isn't true hatred in the rivalry. The animosity started before the game, peaked during the game and continued afterward. The result is a lot of hurt feelings, finger pointing and shouting among friends and coworkers around the state and, most importantly, the truly meaningful rivalry everyone craves. No, this doesn't mean the Michigan State game is more important than the Ohio State game for Michigan, but one rivalry doesn't have to trump the other. There will always been an ancient, deep-rooted animosity between Michigan and Ohio State, especially because the game has meant so much on a conference and national level for decades. But it would be foolish to suggest the MSU game isn't at least in the same conversation now. The most important ingredient for an elite rivalry is a matchup that has major ramifications for both teams, and it has to be consistent. Nobody outside the state cares about the Kansas-Kansas State rivalry in football because it never has any national significance. It's the same story with Arizona-Arizona State, Oregon-Oregon State, Indiana-Purdue and many more. If both teams aren't nationally relevant on a consistent basis, the rivalry suffers. This year, Michigan was No. 6 and Michigan State was No. 24. Last season, Michigan was No. 7 and Michigan State was unranked, but the Spartans finished the year at No. 15. Michigan was No. 2 when the teams met in 2016, which was a down year for MSU. But in 2015, it was No. 7 Michigan State vs. No. 12 Michigan. In four meetings since Harbaugh took over at Michigan, both teams have been ranked twice, and at least one of the two has been ranked in every matchup. When college football fans think of the Iron Bowl, Auburn's miracle "kick six" touchdown on the field goal attempt that fell short in 2013. The most talked-about moment from Michigan-Ohio State in the last decade was the controversial spot on J.T. Barrett's fourth-down run in 2016. Great rivalries have unforgettable moments, and Michigan-MSU has definitely delivered in that category. 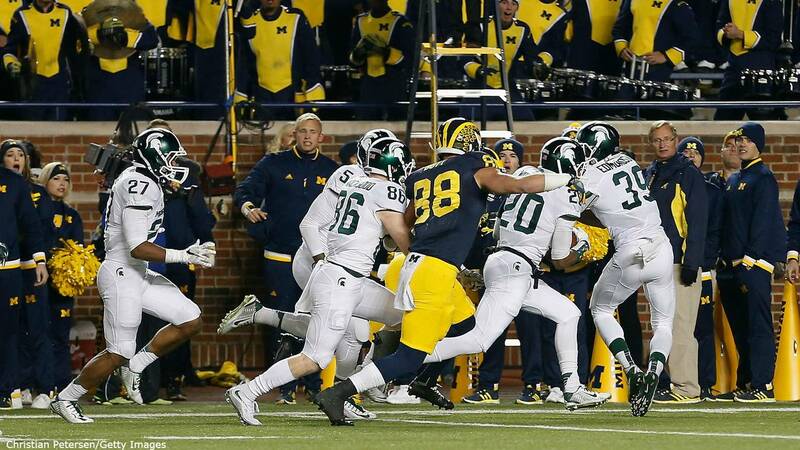 The most obvious play was the dropped punt in 2015, which turned a Michigan victory into a last-second loss when Jalen Watts-Jackson returned it for a touchdown as time expired. That was one of the most gut-wrenching -- or exciting -- finishes to a game in the history of college football, depending on your allegiance. The 2016 game also had a wild ending, as Dantonio's strange two-point conversion attempt was returned for a score by Jabrill Peppers, turning a one-possession game into a Michigan win late in the fourth quarter. Last season, the teams played in a monsoon, with Michigan turning it over five times, Eddie McDoom dropping a Hail Mary on the final drive and the Spartans escaping with a four-point win. 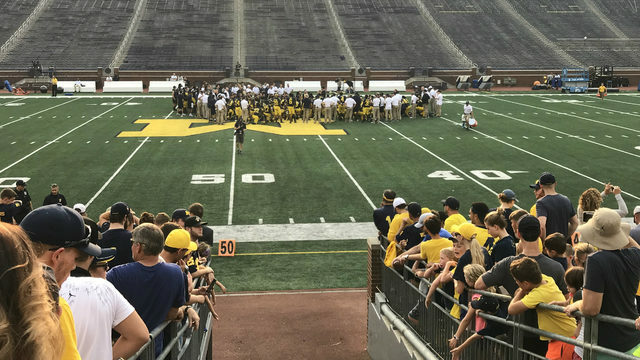 Even though Michigan won by 14 points this year, there was an hour weather delay, a three-fumble sequence in about five minutes of game time, a quarterback catching a touchdown pass, tipped passes caught by onlooking players and more. Whenever Michigan and Michigan State meet, strange things seem to happen. That makes every game even more memorable. What's a rivalry game without some pregame chatter? Well, Michigan and Michigan State went beyond that Saturday. It started when Michigan State came out late for its pregame walk, which involves players walking the length of the field arm-in-arm. Michigan players were already on the field warming up because MSU didn't walk at its normal time. The Spartans weren't going to break ranks for Michigan players (except for Khaleke Hudson), and the Wolverines sure weren't going to take that lying down. It turned into what should be affectionately called "pregame-walkgate." 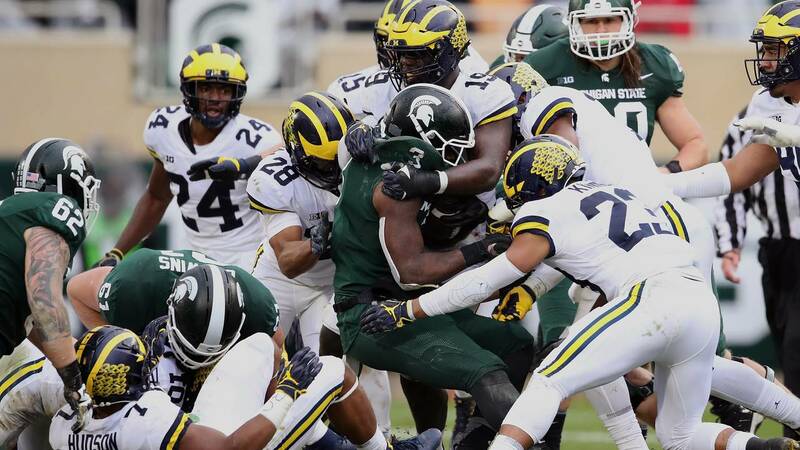 Michigan players say MSU players "clotheslined" them and ripped cornerback Lavert Hill's headphones out of his ears. Then, Michigan linebacker Devin Bush went to midfield and tore up the Spartan logo with his cleat. He didn't care to hide it, swinging his legs wildly and taking out huge chunks of white grass. Fans can squabble over who was in the wrong and which team is holier than thou, but the reality is both teams deserve blame -- more accurately, credit -- for pouring gasoline on the fire. What made the pregame incidents even juicer was the fact that both coaches fired shots at each other during the postgame press conferences. Harbaugh called Michigan State "bush league" and claimed Dantonio was five yards behind his players smiling during pregame-walkgate. Dantonio called Harbaugh's comments "BS" and told reporters to check video of the incident. Video appears to show Dantonio about five yards behind his players, and he might have been grinning, but it's difficult to tell. 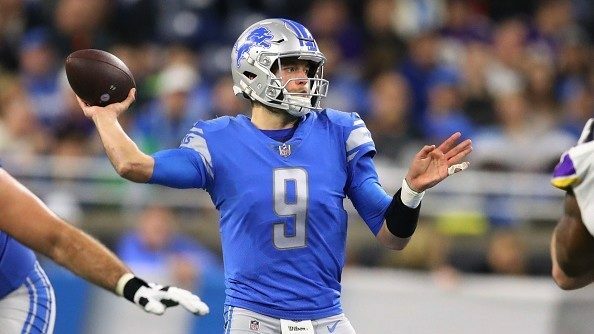 Since the game ended, former, current and future players from both sides have weighed in, most notably DE Chase Winovich, who called Michigan State "little brother," Dallas Cowboys CB Jourdan Lewis, who slammed MSU on Twitter, and thousands of Michigan State supporters calling the Wolverines "classless." Can you imagine next year's matchup, with all this extra fuel added to an already heated rivalry? The game of football has changed a lot recently, with big hits penalized instead of celebrated and extracurricular activity punished more severely. But that didn't stop these teams. 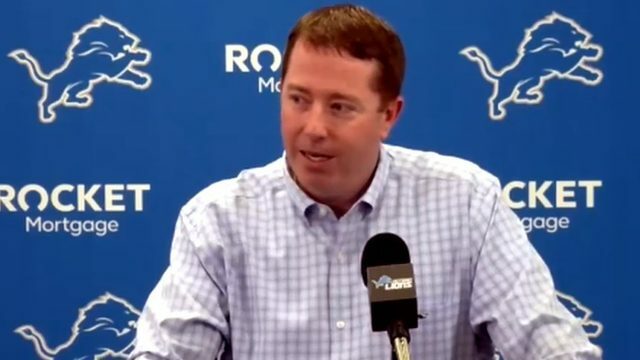 There were six personal fouls -- three on each team -- called during the game, and a roughing the passer. Officials were throwing all kinds of flags after the whistle, and there were skirmishes that went unflagged, as well. For years, Michigan State was known as a tough, hard-hitting team. 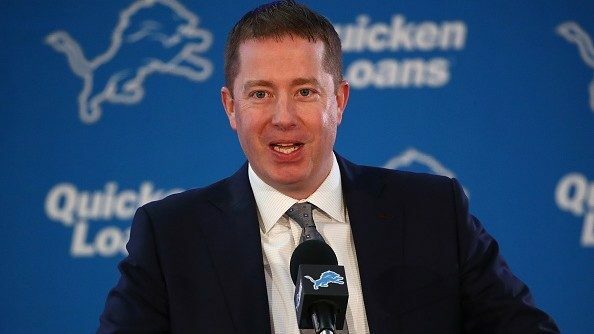 Its defense embraced a mean reputation. 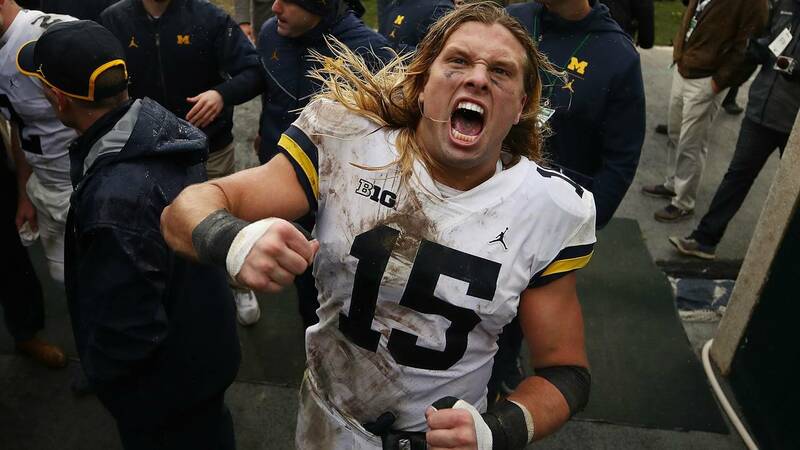 Now, Michigan has filled its roster with guys like Bush, Hudson and Winovich, who play with the same mentality. This is a matchup that has been won by the tougher team through the running game and elite defense. In a way, that makes it even more personal for the players involved. There will always be people on both sides who are unhappy with the antics, and one fan base will be disappointed at the end of every game. But fans wanted a rivalry, and now they've got it, and this is what comes with it. 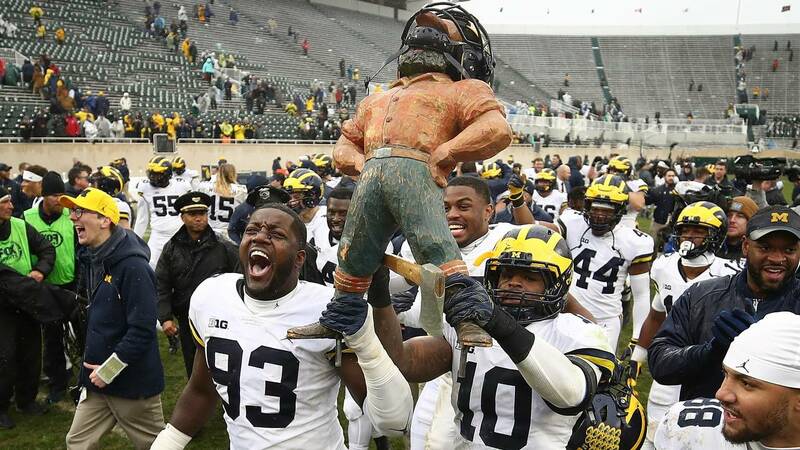 The Block M at midfield of Michigan Stadium won't be safe when the teams meet again next season, and the Paul Bunyan Trophy will surely be paraded around the field no matter who wins. It's the new standard for this Michigan-Michigan State rivalry, and now both teams are fully on board. It might look like MSU is in trouble at 4-3, but the Spartans rebounded from what looked like a death sentence in 2016. Dantonio won't let his program take a step back, especially with Michigan now basking in the national spotlight. No matter how the rest of this season plays out, when these teams meet in the Big House on Nov. 16, 2019, all bets are off.